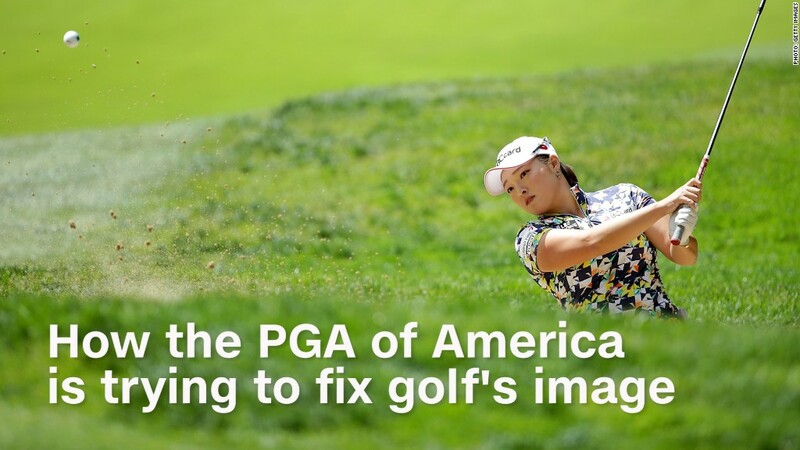 A fun offshoot of golf is introducing more people to the game and providing hope that America's traditional courses will thrive with a new generation of players. Topgolf, a golf entertainment company that's popular with non-golfers, operates driving-range-like complexes with a twist. Their facilities drew 13 million visitors in 2017, with more than half counted as Millennials. The venues feel more like a club than a clubhouse. They feature restaurants and bars and foster a social, almost party-like atmosphere with DJs and cocktails. The flagship location in Las Vegas rises four stories and includes two pools. As for the game, players hit golf balls at "dartboard-like" targets on an outfield and score points. It turns out, visitors who go for the party, leave with a thirst for the game, according to Erik Anderson, Topgolf's executive chairman. "Topgolf is consumable by everybody in any way they'd like to play," he said. Anderson added that by introducing people to the game in a fun way, "Topgolf is having an additive effect" on golf as a whole. The report also surveyed new golfers who'd been playing for three years or less. 23% said they'd started playing after their first Topgolf experience. Of those, about 75% said Topgolf directly influenced their decision. Only 1% of people polled said they'd be less likely to play traditional golf after visiting a Topgolf location. Topgolf's role in helping to grow the game was highlighted by the World Golf Foundation, which mentioned the company in its latest report on the state of the golf industry. The report said that revenue at "alternative" golf facilities like driving ranges grew to $1.1 billion in 2016, up from 2011. It noted "strong performance by Topgolf." Topgolf, which launched in the US in 2005, has grown to include 41 venues around the world. It's adding 13 new locations in places like Mexico, the United Arab Emirates and Australia.